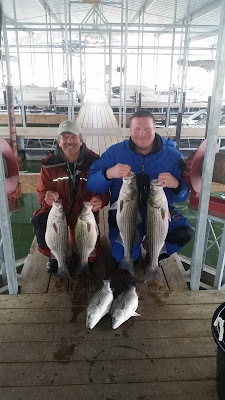 Norfork Lake has entered the early spring bite pattern. Some species are spawning and others are moving out of the deep, cold water to shallower water following the shad. The shad are moving shallower due to the warmer water. 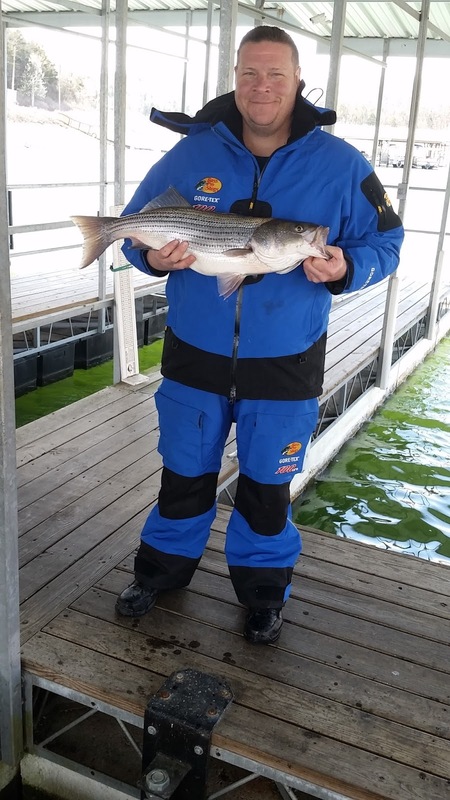 Walleye and white bass have started their early spring spawn while other species are feeding very heavily on threadfin shad. The flowering trees have been blossomed out and the Redbuds are just starting to bloom. Remember the old saying that when the dogwoods are in bloom the crappie are not far behind on their spawn. Well I bet the crappie are not far away from moving into the shoreline. Our lake water warmed quickly this year and is still 2 - 5 degrees warmer than prior years. Last year the surface temperature in the morning was around 50 and 2 years ago it was in the upper 40's. Yesterday our morning surface temperature was 54.5 degrees. As always, the surface temp warms several degrees more during the afternoon with the warm sun. 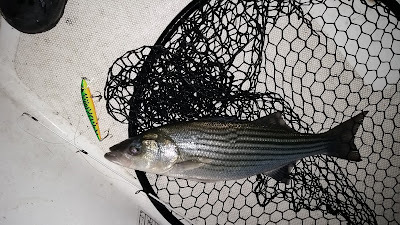 The striped bass bite has been good. They have moved to the shallower water of the major creeks. I am finding big schools of fish roaming large flats as well as close to the creek channels. 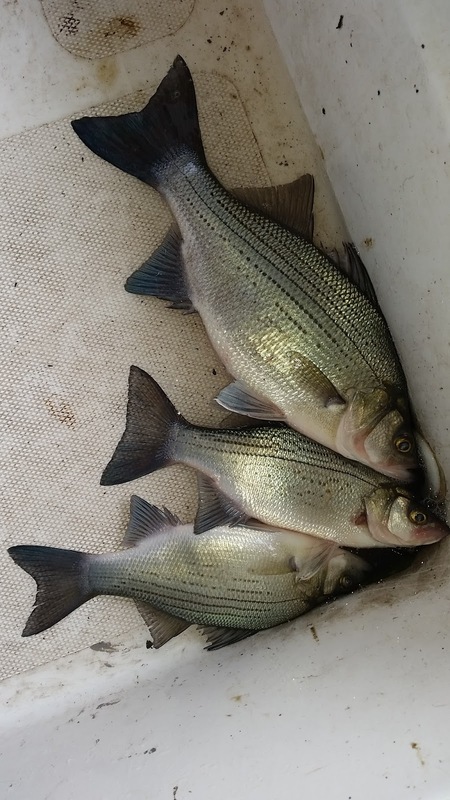 Sunday I was fishing with a friend with live shad. We were in 40 feet of water and a school came under us with fish from 15 feet to 40 feet. All of sudden one pole got buried, then the second, and so forth. 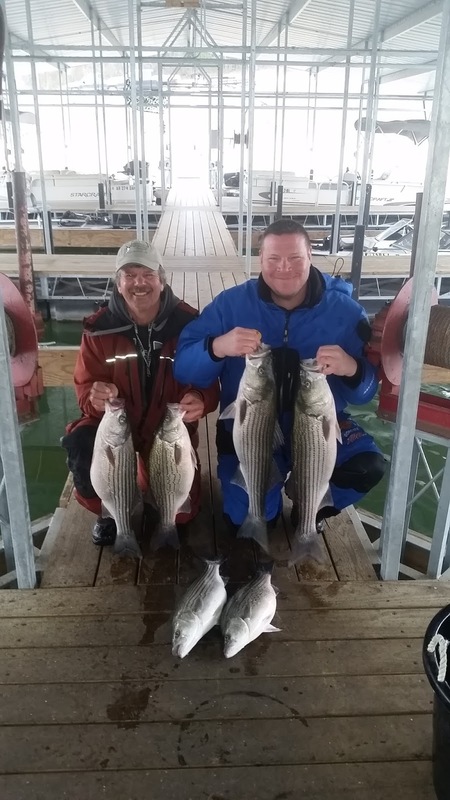 We had 4 big stripers and hybrids hooked at the same time and it was total chaos on my boat. We ended up landing 3 of the 4 with one getting too close to the motor and cutting the line. That must have been Kyle's 40 pounder. :-) Locations vary, but I like to fish secondary points that have the creek channel swinging in close to the shore. I have found fish both on the deeper bluff line side, as well as, points on the shallower side. The best bite at this time, for me, has started around 9AM and goes until the early afternoon. Live bait is working great, but spooning has also picked up a few fish. Tolling with swimbaits or Alabama rigs are also working very well. You need to get your baits down to around 20 - 40 feet deep as the fish are at all levels. I have also started to fish after dark when the wind allows me. 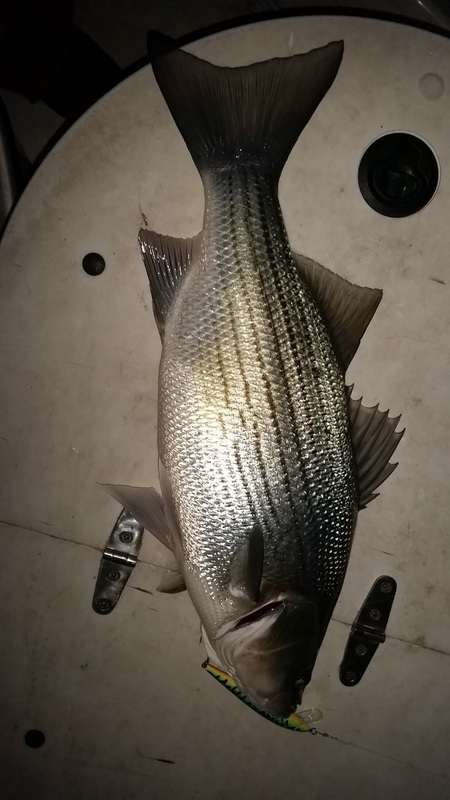 My first time out for the evening was after I wrote my last fishing report and I landed a couple stripers. I have fished several other times after dark and caught either stripers or hybrids each time. The fish have started to feed after dark so check the hooks on your suspending stick baits and find a good shallow point with deep water close and give it a try. It is a blast hooking into a large striper when you can not see anything and everything is by feel. 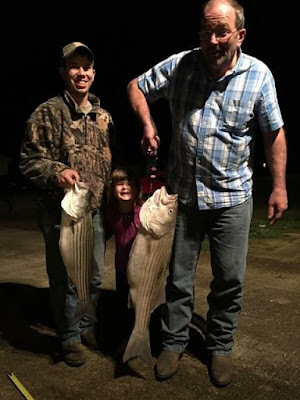 A couple of Hummingbird Hideaway Resort Facebook followers read my last report and headed out after dark and landed a couple really nice fish. Largemouth Bass are also starting to move a little closer to the shoreline. I have caught a few in the early morning up tight throwing a jerk bait, but most have been on the short side. I would look at about 15 - 30 deep off of bluff line points. Some will be suspended, but the bigger ones will be on the bottom. It will not be long until they start moving in with a vengeance and start their pre-spawn feed. Another great spot to fish will be brush piles in 20 to 30 feet of water. The bass will be hanging around the outsides of the brush watching for those shad that decide to venture away from the brush. Plastics worked along the bottom are working and crank baits are starting to pick up some nice fish. White bass are still back in the creeks and coves finishing up their spawn. Try casting out Rooster tails or Roadrunners up close to the shore-line and retrieve slowly. You will also start to pick up some nice crappie fishing this way. After the majority of white bass finish up spawning they will start moving out to the flats and then topwater action for whites will start. I look forward to this time as it is a blast. I am seeing a few whites come up early in the morning, but nothing to get real excited about yet. Norfork Lake level rises slowly when power generation stops and drops when the generators are turned back on. Currently minimal generation is occurring and the lake level is 546.16. The surface water temperature in the morning has been 53 - 55 degrees depending on how far back in the creeks you go. The water is stained back in the creeks and the main lake is clear to partly stained.